Islamic State attack in Sinai. Islamic State carried out an attack on Egyptian security forces in Sinai a week ago and captured a Christian criminal research expert, the militant group said. The man was involved in the government’s campaign against militants, the group said in its weekly newspaper al-Naba. It gave no further details. 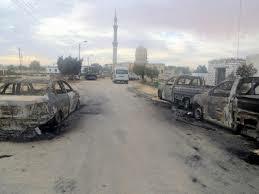 The attack on January 18, was west of al-Arish, the capital of the North Sinai province, the group said. An Egyptian officer was killed and two soldiers injured, it said, adding several Egyptian soldiers were killed or wounded. Security sources in northern Sinai confirmed the incident, saying three security personnel were killed. The Christian was on a bus when he was captured. Last week the military said Egyptian security forces killed 59 militants in the Sinai peninsula recently and lost seven of their own. The figures covered the “last period”, the military said without specifying dates or locations of operations. It did not give the identity of suspects or affiliation.